Choosing a tennis racquet is a big decision. You need to make sure you have the right racquet for your skill level now and one that will allow you to become a better tennis player. Some players may need to find a racq​uet to help with power, while others need to find more control. In this complete guide we will show you how to choose a tennis racquet for beginners, intermediate or advanced skill level players. First, you'll learn general specifications of tennis racquets so you know what to look for. Then, you'll discover the key questions you need to ask when picking a racquet. At the end of this guide, you should have a clear picture which type of racquet is right for you. When you start your search for a new tennis racquet, there are a few things to consider. For this guide, we will use the following scale. Just starting to learn tennis, I’ve never played, or I've only played a few times for fun. I’m thinking about getting more serious and am looking for a racquet to practice more. I might start taking lessons too. I used to play as a kid some, but haven’t played in years, or I started playing a recently and want to take my game to the next level. I can hit it over the net with consistency but don’t have a lot of control where it goes. I just try to get it in the court. I can hit forehands and backhands, but I prefer one side to the other. I can serve but don’t hit with a lot of power or spin. I play regularly. I can control shots with placement, spin, and power. I can serve with spin and power too. This would be 4.0 and higher on the USTA scale. There is a ton of technology that has developed in tennis racquets over the past 20 years. It can get confusing when you try to consider things like balance, swingweight, string pattern and more. We’ve made it simple for you, with just the most important specifications below. This chart will give you a high level idea of what to look for in a racquet as you get better at tennis. Several major factors to consider when choosing a racquet. To make it easy for you, we’ll go over key characteristics to look for when finding a racquet to fit your game. You will hear racquet size called a number of different things - mid sized, regular, standard etc. Normal adult racquets are 27 inches long. Oversized racquets are over 27 inches, up to 28.5 inches. As the chart indicates above, more advanced players use smaller racquets, while the longer racquets are better for beginners. Read on to learn the advantages of each. Tennis racquet grips are labeled from 1 - 5 based on their circumference. For most adults, a 4 ⅜ (3) grip will do. If your hands are very small, then use a 4 ¼ grip, labeled 2. Use a 4 ½ grip (4) if you have larger than normal hands. If you’re unsure on which size grip to use, choose the smaller grip and you can always add an extra overgrip to make up the difference. Most beginner racquets are lighter weight, under 10.5 ounces when strung. For more advanced players, racquets will be heavier. Racquets usually will either have labeled a strung weight or an unstrung weight. The difference obviously, is the weight of the strings in the racquet. In general, lighter racquets will be easier to swing and give you less chance of tennis elbow or other injuries. Now that you know the primary factors for the tennis racquet, we need to look at your needs by analyzing strengths and weaknesses of your tennis game to find the best racquet for you. For more on finding your ideal racquet specifications, check out this diagram on how to find a perfect racquet from Midwest Sports. Before choosing a racquet, you need to know more than just your skill level. You also need to know what your strengths are as a tennis player. If you have a game based on power, for example, you may want a racquet with more control to counter balance that. Below we'll show you how to choose the right racquet based on your unique strengths and weaknesses as a tennis player. The rule of thumb for power is this. The bigger the racquet head, the more power you’ll be able to generate. If you do need more power, look at racquets 27.5 inches and longer with a circumference of at least 100 square inches, depending on skill level. More weight in the head of the racquet and a thicker frame can also help generate more power on groundstrokes. For more control, choose a racquet that is a little smaller, usually 27 inches and under 100 square inches. This will mean you have a smaller sweet spot, but better control when you hit it. These racquets usually have a tighter string pattern as well (strings closer together), which helps add to the control. Beginner tennis players don’t need to consider the length of their stroke yet, but for intermediate and advanced players, this is important. If you have a longer takeback and follow through with a fast swing, then you’ll want a regular sized racquet at 27 - 27.5 inches for control. For players with shorter swings who almost punch at the ball, consider a larger, more powerful racquet. However if you’re playing to become a more advanced player then choose a racquet in the category you’re trying to level up to (see chart above). If you play mostly singles and hit a lot of groundstrokes from the baseline, then you’re likely not playing at the net very much. This means you’ll have time to start your swing and won’t need a racquet with a lot of mobility. In this case, a bigger racquet will help you generate the power you need from the baseline if you need it. A bigger racket head will also have a larger sweet spot. If you don’t practice for dozens of hours each week like the pros, you may need a bigger sweet spot because you won’t necessarily make contact in the same spot on the strings every time. Racquets like the Babolat Pure Drive and Pure Aero are great options for singles only players. 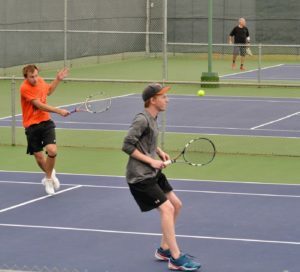 Doubles is a very different game than singles, requiring quicker reflexes and a more mobile racquet. If, however you play a lot of doubles, and need to be able to move quickly at the net with a racquet that you can control, then use a normal racket head (under 100 sq. inches). In this case a smaller racquet will increase your versatility at the net to hit volleys. Since you have less time to react, this extra maneuverability is crucial. It will also give you more control on your volleys and allow for better placement. At this point you should have an idea of what specifications within a certain range you need to best suit your game. Next, we’ll cover the best racquets for specific types of players and what advantages these players need based on their level. Beginner tennis players who are thinking about taking the game a little more seriously will want to buy a racquet that allows for improvement. You’ll want something that is forgiving, with a big sweet spot. As you get better at tennis, you need a racquet that will be effective for intermediate players too. Generally beginner racquets have a head size over 100 square inches. If you do plan to become an intermediate or advanced player, we don’t recommend any racquet over 107 square inches. Here is our list of top beginner racquets. Some of these racquets are also on the intermediate list as they are great for transition players trying to get better. For intermediate players who can hit the ball over with consistency, but may not be advanced to accurately control and spin their groundstrokes, you have to find a tennis racquet that is well balanced. You don’t need as much power as you did when you were a beginner player since you have a more developed swing at this stage. Players also will want a game improvement racquet that will let them continue to become better. Intermediate players shouldn’t use racquets more than 107 square inches if they plan to become more advanced. I have seen people as high as a 4.0 in usta tournaments use racquets as large as 115 square inches. The problem is they won’t be able to improve any more than that. They have reached their peak with that particular racquet. Here are the top tennis racquets for intermediate players. We do have some racquets from our advanced and beginner list as well if you are at a transition phase, or want to level up your game. More advanced tennis players have more factors to consider when choosing a tennis racquet. This is where we get into the nuances of the game of tennis. Things like swing length, swing speed, strength and control become important for this type of player. For example, a strong young athlete with a big swing may need more help with control. But if you’re an older player who isn’t as physically fit, a lighter racquet with more power might be best for you. In either case, we have a great racquet for you below. Higher level tennis players need a racquet with a combination of mobility, control, and comfort. The best tennis racquet brands on the market all have a wide variety of racquets for a wide range of players. For this reason, when considering what racquet is best for you, you’ll want to consider the size, weight, string pattern and other factors, more than the brand. The four leading tennis racquet brands are Head, Wilson, Prince and Babolat. Other less common brands include Yonex, Dunlop and Gamma. All six of these brands have racquets for all types of players, and they each have multiple top professional tennis players who use and endorse their brand. Women tennis players typically have better control than men but do not generate as much power or spin. So in general, power and spin are most important when searching for the best ladies tennis racquet for your game. For beginner adult women and teenagers, the Head TI S6is our best pick. The Head Liquidmetal 8 or the Wilson Hyper Hammer are also good options that provide a little extra mobility. These racquets are all lightweight, with a big sweet spot for comfort, and a large head size for power. Intermediate and advanced women tennis players will need a racket with more mobility and control, but one that doesn’t sacrifice power. For this type of player Babolat makes the two best rackets on the market. The Babolat Pure Drive and Pure Aero racquets are proven to increase power and spin making them the best choice for this type of player. If you’re have a bit smaller budget, the Prince Textreme Warrior 100 and Head YouTek Instinct MP are the next best choices. When choosing a tennis racquet for your child you’ll want to pick something they can grow into. If your child is 6-12 years old, then they’re likely growing fast. The last thing you want is to buy them a racquet that they will outgrow in 1 year. Here is a good sizing chart for kids under 12. If they’re above or below average height and strength for their age, then you’ll want to adjust accordingly. Our choice for the best junior tennis racquet for kids under 12 years old is Wilson's US Open Racquet. If your unsure, then buy the bigger racquet so your child can grow into it. For kids just starting out, this Wilson US Open tennis racquet is a great option. It comes in each size in the chart above. For children over 12 we recommend adult sized racquets. If your kid is a beginner or is undersized for their age, buy the Head Liquidmetal or the Wilson Hyper Hammer. These racquets are adult sized but lightweight, making them the best choice for beginners in their teens. For intermediate to advanced kids transitioning from a junior racquet, or stronger kids who don’t need as much help with power, look at the adult racquets from above. They will need a racquet that will allow them to continue develop their tennis game as they grow physically. Ultimately, the best way to make sure you choose the the right racquet is to know your own game. If you know the type of player you are, and the type of player you want to be, you can be confident in choosing a tennis racquet that can support those strengths and weaknesses. Whether you want to be highly competitive, or just a recreational player you should now know how to choose a tennis racquet.